The gall bladder is a small sac, attached to the under surface of the liver that holds bile. Bile is a digestive juice, produced by the liver, which is used to break down dietary fats. Some things that contribute to the formation of gallstones include the crystallisation of excess cholesterol in bile, and the failure of the gall bladder to completely empty. This is a minimally invasive technique to remove the gall bladder. 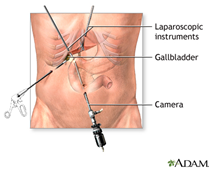 Some of the studies suggest that patients have fewer problems and a shorter hospital stay when their gallbladder is removed using a laparoscope compared to people who have open surgery. It involves using a tiny camera and surgical instruments that are inserted through small cuts (incisions) in your abdomen. The gall bladder is removed through one of the incisions. Sometimes, the surgeon has to convert the surgery to open cholecystectomy due to lack of surgical access and other surgery related issues. Avoid heavy lifting and physical exertion under advice from your doctor. Expect your digestive system to take a few days to settle down after surgery. Common short term problems include bloating, abdominal pains and changes to toileting habits. Pain in your belly. You may also feel pain in 1 or both shoulders. This pain comes from the gas still left in your belly after the surgery. Continue walking and the pain should ease over several days to a week. If you have a large white gauze dressing covering your wounds, these may be removed the day following surgery. Underneath will be small white steri-strips. These should be left alone. Keep it clean and dry. These steri-strips usually fall off by themselves within two weeks of surgery. You may gently shower the day after surgery. Try not to remove the white steri-strips. You may take a tub bath 7 days after surgery. A sore throat from the breathing tube. Sucking on ice chips or gargling may be soothing. Nausea and maybe throwing up (vomiting). Your surgeon can provide you with nausea medicine if needed. Loose stools after eating. This may last 4 - 8 weeks. Skin redness around your wounds. This is normal. Your temperature is above 101&#x2109;. Your surgical wounds are bleeding, red or warm to the touch or you have a thick, yellow or green, or milky drainage. Your stools are a gray colour. 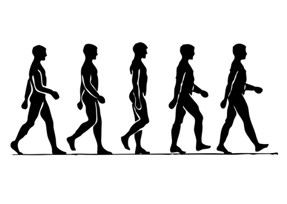 Start walking after surgery. Begin your everyday activities as soon as you feel up to it. Move around the house and shower, and use the stairs during your first week home. If it hurts when you do something, stop doing that activity. Avoid strenuous activity, like moving, carrying or lifting heavy objects for 10 to 14 days, or as directed by your doctor. After six week follow-up you can usually start your regular exercises. If you were given an incentive spirometer in the hospital, continue to use it as directed for 3-5 days while at home. If you do not have an incentive spirometer, it is important to practice deep breathing exercises 4-5 times per day. This helps to keep your lungs clear. You may be able to drive after 2 or 3 days if you are not taking narcotic pain drugs. You may be able to go back to a desk job within a week. Talk to your doctor if your work is physical. Follow your doctor's instructions . Generally it is suggested to eat soft / bland diet such as chicken noodle soup, crackers, Gatorade or tea for first 2-3 days after your laparoscopic cholecystectomy surgery which is followed by normal diet. Avoid fatty or spicy foods for 1 month. Avoid strenuous activity for 6 months after your laparoscopic cholecystectomy surgery. Include lean protein sources in the diet such as lean chicken, soya, low fat dairy and fish. For the first two weeks, post-surgery, go slow on fiber like fruits,vegetables,whole grains and beans. Gradually, include lots of fresh, seasonal, local and if possible organic Fruits and Vegetables. After 1 week, add plenty of Whole Grains (whole wheat flour, brown rice, split beans or dal). Increase vinegar and lemon juice in the diet as it aids digestion. Avoid inclusion of heavy protein sources in each meal such as organ meat or red meat. Refined ingredients like white rice, white flour, maida should be completely omitted from diets. Especially important if diabetic. Avoid combination of sugary and refined foods like cakes, pies, ice creams as they do the most harm. Especially important if diabetic. 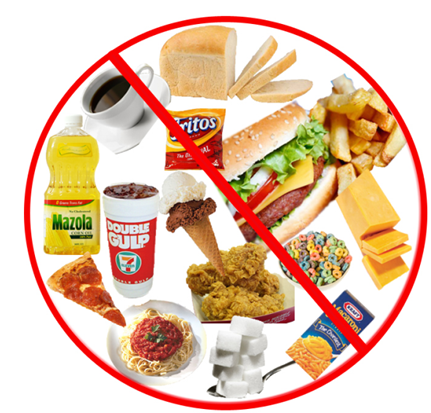 Avoid highly Fatty, fried, greasy and spicy foods as fat cannot be easily digested post gall bladder removal.